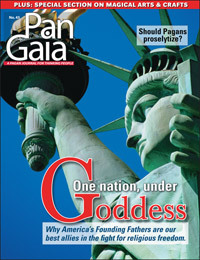 PanGaia #45 Religious Freedom (download) [pg045e] - $5.95 : BBI Media - Magazines that feed your soul. Are you tired of the far-right Christians claiming that “America is a Christian Nation” as if they had a trademark on the Constitution? Me too. How about a new way of thinking about this absurd claim? In Diana Paxson’s meticulously-researched and thought-provoking article “American Ancestors,” she urges us to look towards the Founding Fathers (and Mothers) as our best allies in the fight for religious liberty. Her article provides plenty of rational ways to fight back against the tendency to shotgun-marry Christianity and patriotism -- not to mention ideas for crafting magical and ritual responses to so-called “spiritual warfare.” Although this issue was published in 2007, this article is more timely today than ever before. This issue also includes a HUGE section on Pagan crafts and do-it-yourself projects including scrapbooking, beading, crafting with found animal parts, quilting, creating milagros, and making handcrafted ritual tools. Plus North Dakota Pagans, “Should Pagans Proselytize?”; · “Tarot Journey: The Emperor,” and much more. 80 illustrated pages. Edited by Elizabeth Barrette. Winter 2006.